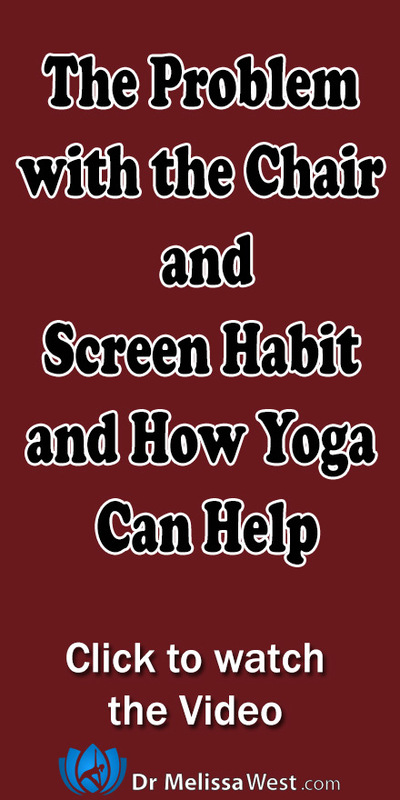 Stay tuned all the way to the end because I’m going to tell you where you can go to get a pdf of 3 easy steps on how to take a break from the chair and screen habit. Sitting in chairs for long periods of time can cause joint problems in your lower body as well, from arthritis in your hips and knees, tendonitis, bursitis to lower back problems such as sciatica. Researchers have recently discovered that sitting time itself is a risk factor for cardiovascular disease, even for those people who exercise regularly. In addition our arms spend their time immobilized by the sides of our bodies with our wrists flexed and our fingers bent as we text, mouse and keyboard. Also, your feet are immobilized by shoes and socks, pressing your toes together, shortening your calves with heels, and your toes grip flip flops and slide on shoes causing hammer toes. Finally we live in a culture of over-stimulation from too much information, social media, over extending ourselves, the stress of driving and commuting, constant noise, and excessive light which leads to anxiety, stress and insomnia. Because we spend so much time sitting, with our heads in front of screens, our bodies get stuck in a kind of square root position, with our heads jetting forward and our nervous systems jacked up. Yoga can help us to calm our nervous system and gently begin to move our body again so that our arms are not stuck at the sides of our bodies, our wrists and fingers flexed, our hips and knees flexed. By doing so, we begin to open up the possibility of being able to take positions off our chairs such as standing and sitting on the floor. Today I will show you some gentle movements for your wrists and fingers to help move them out of their constantly held texting and keyboarding position. If you would like more support in preparing your body to be able to move your arms away from the sides of your body from texting and keyboarding and core support, hip, knee and ankle mobility to be able to be free from chairs then I recommend our brand new Benefits of Tortoise Pose class in our membership community. In the benefits of tortoise pose class you will move your hips, shoulders, spine and feet through a full range of motion into tortoise pose. You will take a break from the chair habit and try different sitting positions on the ground to find the stability and mobility of your own body and self reliance. Tortoise pose will help you to move inwards to slow your mind and calm your body, easing anxiety and stress. Today we talked a lot about the physical, mental and emotional detriment of spending too much time in front of screens sitting on chairs. If you would like 3 steps for taking breaks from the screen and chair habit then click on the link below.